PT Terminal Petikemas Surabaya - TPS or known as "Surabaya Terminal Container" is a reputable company in Indonesia that is involved in port services. 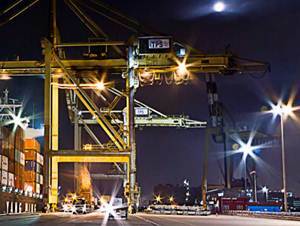 The Company running business in the field of container terminal services located in Port of Tanjung Perak Surabaya. Its business include container discharge services, container loading service, container receiving services, container delivery services, container freight station services, train services between Surabaya Terminal Container and Kereta Api Logistik (KALOG). PT Terminal Petikemas Surabaya is a strategic subsidiary company of PT Pelabuhan Indonesia III (Persero) or Pelindo 3 Group, one of the leading state-owned port operator in Indonesia. According to Pelindo 3 Group's profile as cited by JobsCDC.com, PT Terminal Petikemas Surabaya is 50.50% owned by PT Pelabuhan Indonesia III (Persero), 49.00% by P&O Dover (Holdings) Ltd, and 0.50% by KOPELINDO III. Maximum age of 35 years old prior to 1 January 2017. Minimum S1 preferably from the Department of Industrial Engineering / Statistics. The candidate with prior experience minimum of 3 years in in the field of Container Terminal / Shipping / Logistics Industry is preferred. Have good analytical skills and work experience as an analyst is preferred. Operating knowledge of Ms. Office and able to create a report. Excellent proficiency in English both oral and written. Have a good physical health (Height and weight proporsinal and not color blind). Minimum D3 from the Department of Department of Shipping / Shipping / Maritime Transportation. The candidate with prior experience minimum of 3 years in in the field of Container Terminal / Sailing is preferred. Have a good knowledge of the loading / unloading of ships. Maximum age of 30 years old prior to 1 January 2017. Minimum S1 from the Department of Accounting / Taxation with a minimum GPA of 3.00 (scale of 4.00). The candidate with prior experience minimum of 2 years in in the field of finance or taxation (KAP / Tax Consultant) is preferred. Strong knowledge of Taxation Regulations with its application. Able to prepare tax returns and financial statements. High integrity, responsibility and discipline in work. JobsCDC.com now available on android device. Download now on Google Play here. Please be aware of recruitment fraud. The entire stage of this selection process is free of charge. PT Terminal Petikemas Surabaya - D3, S1 Staff, Supervisor TPS Pelindo 3 Group December 2016 will never ask for fees or upfront payments for any purposes during the recruitment process such as transportation and accommodation.